The Hedge Maze begins immediately outside the Western Doors of Manatee Mansion. 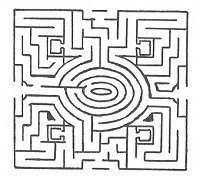 The Stranger successfully made his way through the maze using the Labyrinth Map he found in Shack 2. The maze is home to "diseased" dogs, large vicious and predatory. The Stranger was attacked by a pack of them but escaped.